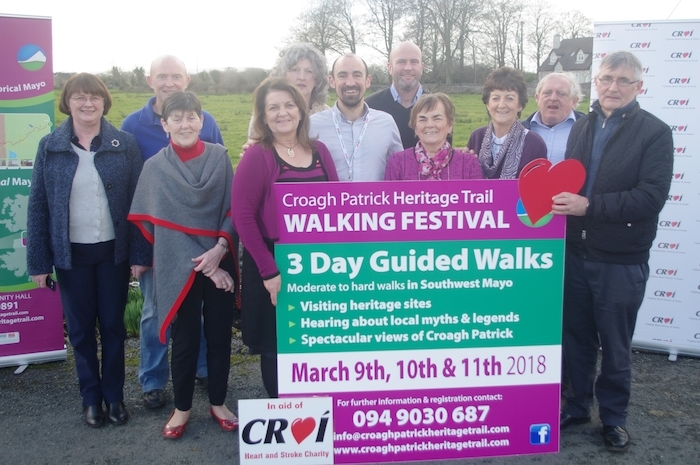 At the launch of the Croagh Patrick Heritage Trail walking festival, in association with Croi, were: Breege Blake, Brendan Murphy, Philomena Browne, Mary O'Connell, Pauline Dixon, Luigi Ryan (Croi), Tom McLoughlin, Sr Maureen Lally, Mary B Prendergast, Brian Hoban, and Martin Larkin. Do you have an hour or two a month to spare? Foroige is calling out for new volunteers for Foroige services in Castlebar for its STEAM projects. The group is looking for adults who could give a few hours a month to work with young people aged 10 to 17 years. Any interest in music, technology, gadgets, art, photography, film making, and fun activities would be a bonus but not essential as all training will be provided. To find out more contact Stephaine on (086 ) 6017337 or [email protected]. Bingo takes place every Monday night in Balla Resource Centre at 8.30pm. If you are not in you can’t win. Yogalates takes place on Tuesday nights at 7.30pm in Balla Community Centre. For more information contact Pat Kirby on (087 ) 2617309. The Castlebar Active Retirement group meets on Wednesday afternoons from 2pm to 4pm in the Social Services Centre. The committee has arranged a number of events that will take place in the coming weeks, including 10-pin bowling, wellness talks, outings and excursions. New members are always welcome. A Bible study group meets on every Wednesday night at 8pm in Balla Community Centre. How Food affects your Mood presented by Vivianne Maloney takes place on Monday, March 12, from 8pm to 9.30pm in the Family Centre in Castlebar. Certain foods types are now being recognised as causing instability to our brain function and emotional wellbeing while others offer us a chance to maintain a healthy, consistent mood, give us more energy, and provide us with better nourishment for our bodies. In this talk you will discuss what our physical needs are in relation to a balanced mood, while also focusing on the healthy food choices you can make to enhance your brain function and emotional stability. (People with special dietary needs or restrictions should consult their GP or dietician ). Cost is €10. A talk on the transition from primary to post primary, facilitated by Helen Mortimer, will take place on Monday March 12 from 7.30pm to 10pm in the Mayo Education Centre. Every year more than 50,000 children in Ireland move from primary to post primary education. This course is aimed at parents whose child is in fifth or sixth class or has just moved from primary to post primary school. This session explores areas such as: choosing a school for your child, preparing your child for post primary school, subject choice, school policies, home school communication and parent/teacher meetings. Helen Mortimer has extensive research experience focusing on better outcomes for children, resilience, and the promotion of empathy. This event is free of charge and this programme is organised in collaboration with the Mayo Education Centre. If you would like an item included in the West Mayo Community Diary, email [email protected] with the item by 5.30pm on the Monday before publication.